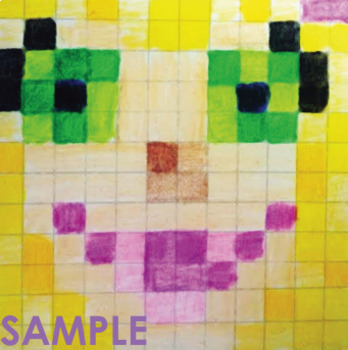 This lesson is a new approach to the typical portrait art lesson.This lesson can be a stand alone art class lesson or can be used in conjunction with a math lesson. This lesson is based on a grid and can integrate math. The Art elements introduced in the lesson are tints, variety and craftsmanship. The goal of this project is to enhance ownership over creative lessons and to integrate math into the creative experiences of elementary students. Many students are very interested in Minecraft and interdisciplinary units are being introduced nationwide with the Minecraft themes in an attempt to interest students in learning. This lesson can serve as a formative assessment for the Art teacher and a checklist to keep students on task.